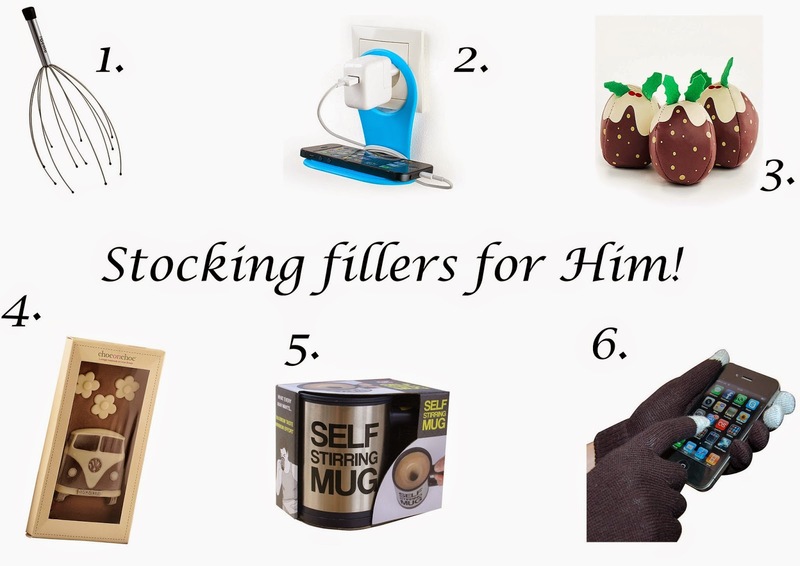 Touch Of Belle : Stocking Fillers For Him Under £10! 1. No this isn't some type of fancy whisk... its a head massager and trust me it is amazing! It is so relaxing and would make a great stocking filler! 2. when you try to charge your phone but the wire doesn't reach the table and you don't want to leave your phone on the floor this is a great little way to hold your phone while its charging! 3. This is the perfect stocking filler! Its something for all the family to do on Christmas day! 4. Who doesn't love a bit of Chocolate?! I love the little design of this! 5. Need I say more? I hate when you think you have stirred your hot chocolate in and then sit down to find its still lumpy at the bottom this solves this as you can stir your drink on the go! 6. Now the weather is getting colder, most people have started to wear gloves but its a real inconvenience to have to keep taking your gloves off to text.. well now you don't have too! This handy touch sensitive gloves allows you to keep your hands warm and stay social at the same time! Let me know in the comments what you think of these stocking fillers! The juggling Christmas puddings look so cute!! I love number three - very cute.